As far as I can tell there are 3 options of programming an AVR using avrdude with the Raspberry Pi gpio pins. First there's Gordon Henderson's avrdude version 5.10, which has patches to bitbang the gpio pins. Gordon also patched Arduino 'boards.txt' and 'programmers.txt' files to have the Gertboard, Gertduino and avrdude 'gpio' programmer recognized by Arduino. There's also this avrdude that's using 'linuxspi': http://www.raspberrypi.org/forums/viewt ... 44&t=45211 That works great as a standalone very fast avrdude, but reportedly doesn't play nice with the Arduino IDE (which very well may not be a concern to you). Then there's the current upstream version of avrdude-6.1 (http://download.savannah.gnu.org/releases/avrdude/) which supports bitbanging GPIO pins out of the box. It doesn't need changes to the source code, a simple compile will do. It only needs the 'linuxgpio' programmer enabled in /etc/avrdude.conf to set the correct pins and it works. This seems the cleanest and most future proof option to me. I found it to be very reliable (use the -i option when setting fuses). To support those, I've been working on a script that makes it as easy as possible to set these boards up. It consists of a menu, with "Install everything in 1 easy step", "Custom install" and "Fuse settings" options. There are also options to easily install additional software such as wiringPi, the 'avrpi' tool, and setting up some extra projects (Arduino-Makefile, LUFA, ...). The script installs the Arduino library and IDE and a pre-compiled avrdude (avrdude_6.1-2_armhf.deb) and config. It also patches Arduino 'boards.txt', 'programmers.txt' and 'USBCore.cpp' files (that last one was necessary to make an ATmega32u4 also work on 8MHz in the Arduino library). The avrpi-tools setup script is here: https://github.com/onandoffables/avrpi-tools. Everything can be installed and set up from this menu. The repositories mentioned below are called from the setup script if it needs them. The 'avrpi' tool makes it easier to control the board from the Raspberry Pi (reset, flash firmware, start serial terminal etcetera). 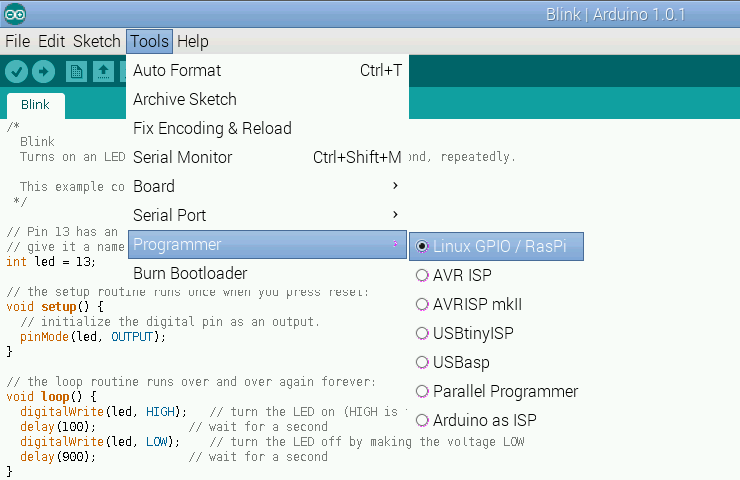 The pins "avrdude-6.1 linuxgpio" uses are the same ones that "Gordon's avrdude-5.10 gpio" uses. So it was little effort to add the Gertboard and Gertduino boards in the mix. I also took the liberty of adding Alex's new RasPiO Duino board in the setup menu. Note that for Gertduino, you still need the 'reset_off' and 'reset_unexport' scripts which are also provided and installed when using the Arduino IDE. 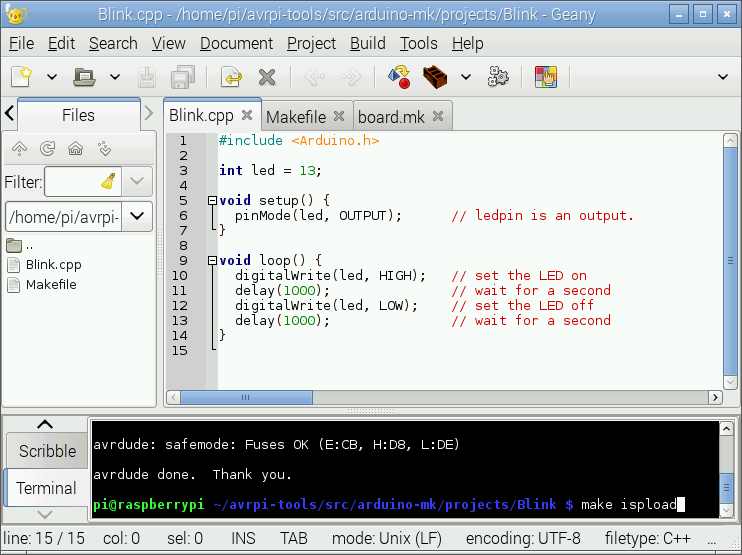 Flashing firmware to Gertduino with the avrpi tool (avrpi -f blinky.hex) takes care of handling the reset pin correctly and the firmware automatically runs. So if you're using one of those boards, you can also use this setup. There's also going to be support for some ATtiny's or AT90's for boards that you've soldered up yourself. Let me know if you want boards/chips added, or do the fork/patch/pullrequest thing. Update to avrdude-6.2 (2015-11-16) in the setup above. * configure.ac: Released version 6.2.
bug #46020: Add TIAO TUMPA to the conf file. * avrdude.conf.in (tumpa): New entry. (pgm.h is gone, config.h is new). warn about this to avoid surprises.